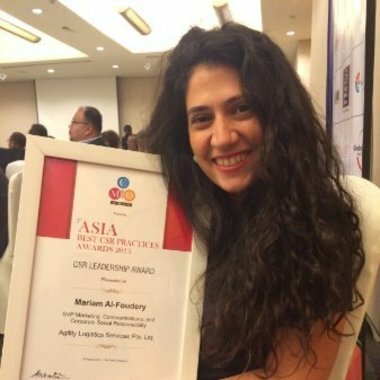 Mariam Al-Foudery heads global marketing and corporate social responsibility at Agility, one of the world’s leading logistics companies. Reporting directly to the CEO, and leading a senior team on four continents, Mariam oversees the global brand, digital marketing strategy, and corporate communications. Mariam also started and leads the corporate responsibility strategy at Agility, which has won multiple leadership awards. Mariam holds a Master’s degree in Development Management from the London School of Economics, which she attended as a Chevening scholar. She also holds a Master’s degree in Media Studies and a Bachelor’s degree in International Relations from Stanford University. Stories. Why They Work and How to Tell Them? Agility is a $4 billion logistics company, and Mariam is the global head of marketing. Almost all their efforts are digital and they are investing heavily in this space. Overseeing the global brand, new brand development for subsidiaries, digital marketing strategy, public relations and social media, and internal communications, Mariam will introduce how do they formulate and roll out the content marketing in a digital age.